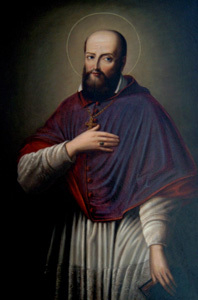 Saint Francis de Sales (French: Saint François de Sales) (21 August 1567 – 28 December 1622) was bishop of Geneva and a Roman Catholic saint. He worked to convert Protestants back to Catholicism, was an accomplished preacher, and wrote books on religious topics. Ceux-là qui aiment à se faire craindre, craignent de se faire aimer, et eux-mêmes craignent plus que tous les autres; car les autres ne craignent qu'eux, mais eux craignent tous les autres. Translation: Those who love to be feared fear to be loved, and they themselves are more afraid than anyone, for whereas other men fear only them, they fear everyone. There are no galley-slaves in the royal vessel of divine love—every man works his oar voluntarily! Have patience with every one, but especially with yourself. Quoted by Bishop Jean-Pierre Camus in The Spirit of Saint Francis de Sales, section "Upon Discouragement"
A heart-memory is better than a mere head-memory. Better to carry away a little of the love of Christ in our souls, than if we were able to repeat every word of every sermon we ever heard. Reported in Josiah Hotchkiss Gilbert, Dictionary of Burning Words of Brilliant Writers (1895), p. 373. The damned are in the abyss of Hell, as within a woeful city, where they suffer unspeakable torments, in all their senses and members, because as they have employed all their senses and their members in sinning, so shall they suffer in each of them the punishment due to sin. Make friends with the angels, who though invisible are always with you.... Often invoke them, constantly praise them, and make good use of their help and assistance in all your temporal and spiritual affairs. Car l'amitié est un amour mutuel, & s'il n'est mutuel, ce n'est pas amitié. Translation: Because friendship is intercommunication of love, therefore where love is not mutual, there can be no friendship. The elephant, not only the largest but the most intelligent of animals, provides us with an excellent example. It is faithful and tenderly loving to the female of its choice, mating only every third year and then for no more than five days, and so secretly as never to be seen, until, on the sixth day, it appears and goes at once to wash its whole body in the river, unwilling to return to the herd until thus purified. Such good and modest habits are an example to husband and wife.